We’d love your help. Let us know what’s wrong with this preview of The Quitter by Harvey Pekar. To ask other readers questions about The Quitter, please sign up. For once, a Pekar offering that leaves me tepid. Tragic. Having read a not insignificant portion of his autobiographical American Splendor comics, this was bound to happen – I was dreading the moment for some time - since inevitably some overlap will occur at some point. So here we are. The premise isn’t half-bad though, with Pekar deciding to go back to his childhood ( a period in his life he previously hadn’t examined as much). The actual execution though, leaves much to be desired. It’s basica For once, a Pekar offering that leaves me tepid. Tragic. Having read a not insignificant portion of his autobiographical American Splendor comics, this was bound to happen – I was dreading the moment for some time - since inevitably some overlap will occur at some point. So here we are. The premise isn’t half-bad though, with Pekar deciding to go back to his childhood ( a period in his life he previously hadn’t examined as much). The actual execution though, leaves much to be desired. It’s basically a dry summing up of fragmented experiences in his youth, all united by the theme of his sometimes crippling insecurity, which has plagued Pekar all his life. Some vivid, to me unknown, experiences are related here, although these salient tidbits are far and few between, and sadly aren’t enough to hold it all together. 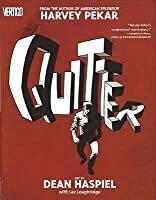 The Quitter as a long form, sustained narrative just falls flat, and subsequently doesn’t merit a publication with Vertigo ( which should have put a better editor on it ) as a standalone graphic novel, unless it is aimed at an audience that has no previous knowledge of Pekar whatsoever. 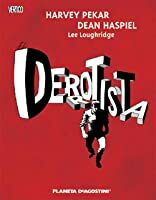 Additionally, I found Dean Haspiel’s art –who is actually quite good, and whose work is more than decent in a technical sense - to be categorically unsuitable to nail that Pekar flavour, which is very specific. It’s too polished, too slick, lacking that low key, rudimentary vitality and poetic realness which forms such a crucial part of what makes an American Splendor comic. Trust me, I am as much of a Pekar fan as the next fellow/gal (everybody loves an old grouch), but I won’t just uncritically gobble up everything the man has put out. Better skip this one, unless you’re a hopeless completionist of course. For an example of a great Pekar graphic novel, my vote would have to go to the fantastic, more recent, Harvey Pekar's Cleveland, which I heartily recommend. Recommends it for: Sarah M. and Ben E.
Generally, I have a very sophisticated system for choosing the graphic novels/comics I read. It goes like this: I bring my kids to the library, peruse the kids section with them for a bit, do a little "mommy reads to her daughter" show at the tinny round table by the window (that is a stupidly designed to be adorable for kids but not smartly designed to be accommodating for the adults that almost always sit with the kids) and then I ditch them while I quickly scan the cooking/gardening/graphic n Generally, I have a very sophisticated system for choosing the graphic novels/comics I read. It goes like this: I bring my kids to the library, peruse the kids section with them for a bit, do a little "mommy reads to her daughter" show at the tinny round table by the window (that is a stupidly designed to be adorable for kids but not smartly designed to be accommodating for the adults that almost always sit with the kids) and then I ditch them while I quickly scan the cooking/gardening/graphic novel sections of the library. At the graphic novel section I pull out anything remotely looking like it will be autobiographical and put back anything turning out to be pre/post/current Apocalyptical. Occasionally this results in a dud but more often than not I'm adequately entertained. "The Quitter" was most definitely a pleasant surprise. In general I know jack-crap about comics and comic book artists. I know enough to say "That sounds familiar" when I hear "American Splendor" mentioned and I've read enough of the now mainstream stuff (blankets, Persopolis, Mause, etc) to fake my way through a conversation when Sarah and I got caught up in a conversation with the owner of Top Shelf comics but STILL when it comes right down to it I am a comic/graphic novel neophyte. I once heard that woman tend not to be involved/interested in Olympic events until they know the back story of an Olympic contenders life. I felt that statement was an overly-simplistic generalization based on a stereotype of females perpetrated by a male dominated media source (and I felt it was mostly true for me). And now, that is how I feel about "American Splendor". I had little interest in the comic before but after reading The Quitter and learning about Harvey Pekar on a more personal level, I will make the effort to actually order "American Splendor" and not just hope it pops up on one of my drive by excursions to the graphic novel section at my local library. 1.Don't ever say you wont do something because then you probably will do that VERY thing. 2. Relax cuz, EVERYONE!!!!!!!!!!!!!!!! is insecure. Harvey Pekar brought the 2nd one home so clearly and honestly, it's what made this book 4 stars for me. Probably one of the most boring auto-bios I have ever read. As the title suggests, the book snapshots the author's life, quitting from one thing to the next. In the end, he fears how folks will like his work. Here's a tip: if you had an uninteresting life, don't write about it. Making it into a graphic novel doesn't really help. Pekar has been writing about his life for so long that it's hard to read a new piece of his on its own terms - if there's a gap, you fill it in with what you already know. And he's always used a lot of gaps, writing about little moments here and there; he'd talk at length often enough, but it was like a tour guide who might stop at any moment and let you just watch things go by for a while. His one long book, Our Cancer Year , had more or less the same rhythm, and it held together because of t Pekar has been writing about his life for so long that it's hard to read a new piece of his on its own terms - if there's a gap, you fill it in with what you already know. And he's always used a lot of gaps, writing about little moments here and there; he'd talk at length often enough, but it was like a tour guide who might stop at any moment and let you just watch things go by for a while. His one long book, Our Cancer Year , had more or less the same rhythm, and it held together because of the intense experience it described (although Frank Stack's art, scruffy and flowing like one big sketchbook, helped too). The Quitter is a long story that doesn't hold together at all, partly because it tries so hard to be a seamless piece, but you can still pull it apart and enjoy some of the mess. He rarely wrote about his pre-adult years in American Splendor; here he skips through them and pulls out episodes that fit his theme, with a frame of his present self saying more or less "This is my theme and here are some examples." The theme is his pattern of freaking out and abandoning various challenges, which seems pathological in some cases and pretty normal in others. There are some vivid stories in there, including a brief successful career in beating up other kids and a humiliating panic attack in a Navy laundry room. There are some great depictions of defective internal drama, like not being sure whether someone hit you on purpose but deciding you'd better hit them back just in case. And there's enough undramatic but particular stuff to give a feeling of organic life, all the seemingly random turns and false starts that somehow ended up at where you are now. But the stories start and stop arbitrarily, dictated by the need to get on to the next example; the pacing within them is spotty too, dwelling for two pages on some trivial scene, then disposing of a major event in one panel or just in a sentence. The frame-narrator intrudes all the time to explain the transitions, so that when the subject occasionally changes without that segue, it seems like an editing error - and in some cases I think it might be, because there are a few captions that seem to assume you know about events he didn't actually mention. This book was published by DC/Vertigo, so you have a writer who's not used to working in a long form and an editor who's not used to working with realistic fiction; this is probably very unfair of me, but I wonder if DC just figured that Pekar's thing was rambling monologues and all they could see was that he was doing his thing. Ever since I saw the film, American Splendor, I have been a big fan of Harvey Pekar. I'm not sure how I heard about The Quitter since it is not new (the copyright date is 2005). If you like Pekar's other stuff: American Splendor or Our Cancer Year, you'll probably enjoy The Quitter. Like his other works, The Quitter is autobiographical. The Quitter begins with Pekar's childhood and takes you up through his first jobs after high school and his life before American Splendor began. It can be painful, Ever since I saw the film, American Splendor, I have been a big fan of Harvey Pekar. I'm not sure how I heard about The Quitter since it is not new (the copyright date is 2005). Like his other works, The Quitter is autobiographical. The Quitter begins with Pekar's childhood and takes you up through his first jobs after high school and his life before American Splendor began. It can be painful, at times, to read about his life. You cringe at the decisions he made and wonder how anyone can be so honest about his own shortcomings and failures. Pekar's honesty, however, is what makes the graphic novel so great. Pekar is so clearly a man of many talents, that it seems unlikely that he could be filled with so much anxiety and have so much trouble. I continue to wonder how, after a hit play about American Splendor, a feature film starring Paul Giamatti, and what must be (post movie) countless sales of his comics, Pekar can still be struggling. Even so, you realize that success for Pekar is always fleeting and anxiety and paralyzing stress is just his makeup. He is a basket-case who chooses to share his triumphs and his many shortcomings with his audience. Learning about his childhood struggles makes the reader realize even more both how talented Pekar is, and how troubled. I'm glad Pekar has chosen to write about his life. Most of the "snippets" about his books mention "the average man" and even Pekar describes his comics as being about "his quotidian life." While his triumphs are not majestic, Pekar seems to be so talented (and he admits, in The Quitter>, for example, to having a photographic memory and not having to work hard to have success in geography and history classes and also to having a great ability in street fighting) that I do not realing see Pekar as an average man. Rather, I think he is an above-average man who has allowed his own self-doubt, nervousness, and weakness to limit his achievements. In a roundabout way, Pekar "brags" about his writing and his Jazz reviews. He was being published at age 19 for writing about Jazz musicians and Jazz music. He had one college English class, yet he was a published writer. Obviously, his comic writing has been critically acclaimed and enjoyed by many, many readers. 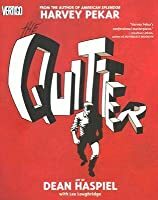 In many ways, The Quitter is a "how-not-to" manual (and the self-deprecating title is some evidence of the fact that Pekar realizes this). You have to wonder sometimes if Pekar isn't intentionally playing things up to maintain his image. I believe that he really is what he purports to be, but his honesty about it all is quite staggering and hard to believe. This was our penultimate entry in the library's Jewish literature discussion group. Honestly, I would've preferred one of the American Splendor collections, but seeing as I'm a hired hand---unpaid, at that---I go with the flow. The Quitter has plenty of the misanthropy one expects from Pekar since he began self-publishing his comics in 1976. It's the most novelistic of his autobiographies, however, eschewing the slice-of-quotidian bafflement approach of AS for a coming-of-age plot in which we fo This was our penultimate entry in the library's Jewish literature discussion group. Honestly, I would've preferred one of the American Splendor collections, but seeing as I'm a hired hand---unpaid, at that---I go with the flow. The Quitter has plenty of the misanthropy one expects from Pekar since he began self-publishing his comics in 1976. It's the most novelistic of his autobiographies, however, eschewing the slice-of-quotidian bafflement approach of AS for a coming-of-age plot in which we follow Harvey's rise through a series of highly unfulfilling jobs until we arrive at that civil service clerkship he famously maintained for more than thirty years. The big revelation shouldn't be so big for anyone who remembers Pekar's contentious appearances on Letterman in the mid-80s, especially the '88 one in which he went batshit on GE and was banned from the show for a couple of years. (It's on YouTube; you can look it up). As The Quitter attests, Pekar was a brawler who developed a defensive fondness for socking anyone who looked at him wrong in the jaw. So pronounced are the fisticuffs I almost think this book should've been called The Pugilist (or maybe Fisticuffs!. The fighting certainly overwhelms what Pekar intends to be the unifying theme of his quitting anything he was good to preclude the possibility of failure. That character tendency makes for a fascinating personality study as HP taps into traditional Jewish themes of father/son resentment and the schlemiel. Yet it also precludes a reader's interest in the cranky, curmudgeonly shtick that Harvey's been at so long that his persona feels as stale as Woody Allen's. Unfortunately, few attendees last night did care, and we thus had some problems really getting into the book. In the end, folks were more interested in the social history of Cleveland and the rise of 50s' jazz-hip culture that the story dabbles in. I tried to jumpstart a discussion of the underground comics that Pekar so influenced, but not even the appearance of R. Crumb toward the end of The Quitter could get yaps a'flappin. So I just kept on truckin'. This is the first hardback graphic novel I've read. The late Harvey Pekar's American Splendor mantra was "ordinary life is pretty complex stuff." So is ordinary growing up. So was Harvey Pekar. That may explain the appeal of Harvey Pekar's observational art, which is pretty much a running narrative of his lifelong struggle to stack Wednesday on top of Tuesday. It has a raw, unprocessed quality to it -- which evokes a flash of recognition even from a reader whose life's circumstances were differe This is the first hardback graphic novel I've read. The late Harvey Pekar's American Splendor mantra was "ordinary life is pretty complex stuff." So is ordinary growing up. So was Harvey Pekar. That may explain the appeal of Harvey Pekar's observational art, which is pretty much a running narrative of his lifelong struggle to stack Wednesday on top of Tuesday. It has a raw, unprocessed quality to it -- which evokes a flash of recognition even from a reader whose life's circumstances were different. There's a lot of conflict, sadness, and rejection in the Harvey Pekar story. some of which may have been self-inflicted, some of which may have been the result of some undiagnosed learning disability or brain injury from all the street fighting (though the extremes to which the street fighting narrative goes begs for some verification - there's no reason to think it's fabricated, but it's surprising that he survived to adulthood, and he wouldn't be the first person to embellish his biography). At the same time, it's not really a sad story. Harvey Pekar ends up surviving and prevailing over everything but his fears. However, I found the title "The Quitter", a loaded, condemnatory word in American Baby Boom English, to be misleading. First, quitting isn't necessarily bad. It depends on what you're quitting. Second, Harvey Pekar didn't quit everything. He quit some things, stuck with others, goofed away opportunities that he later regretted giving up, and took advantage of other opportunities - as many of us also have. He appears to have been a dutiful, devoted husband and father. For one whose art was based on keen observation, including self-observation, he missed the fact that he seemed to suffer from a kind of toxic perfectionism, which led him to quit things that be might have been better off staying with. If he really had wanted to do some life-hacking, that would have been the place to start. 1. Aku tertarik sama orang itu dan penasaran pengen tau kisah hidupnya, bahkan kejadian yang paling remeh sekalipun. 2. Aku belum tau siapa orang itu, tapi setelah baca jadi tertarik dengan kisahnya dan juga pada orang itu sendiri. Read this at the library when I probably should have been working. That's what happens when I sit too close to the graphic novel section. I felt worse for Cleveland losing Harvey Pekar this July than LeBron James's announcement a few days earlier, and when I read the sad news I made a mental note to pick up a copy of The Quitter because I knew it covered parts of his life not covered in his other comics. This is Mr. Pekar's memoir covering the time from his birth to Polish immigrants to his famous Read this at the library when I probably should have been working. That's what happens when I sit too close to the graphic novel section. This is Mr. Pekar's memoir covering the time from his birth to Polish immigrants to his famous job as a file clerk for Cleveland's Veteran's Hospital. There is not much suspense reading this because any casual fan of his comics knows how it is going to turn out. The interesting part is reading about how he winds up where he does -- by quitting anything he feels will be too much of a challenge or when he feels slighted. It is interesting to read how much Mr. Pekar was plagued by anxiety, self-doubt, and what I think are supposed to be panic attacks (including a fateful one he experiences in the Navy). It's unflinchingly honest and heartbreaking that no one could or would help him until much later in life. The Quitter is actually a story of resilience. One of the last stories autobiographical comics pioneer Harvey Pekar wrote, it covers his early, post WWII years as a son of Polish immigrants living in Cleveland. Illustrated by Dean Haspiel, The Quitter is, typically, brutally honest. To an extent not previously explored, Pekar was a fighter and bully in his youth, resorting to violence as a means of earning respect he wasn't otherwise getting from his peers, with whom he didn't fit in. He also had The Quitter is actually a story of resilience. One of the last stories autobiographical comics pioneer Harvey Pekar wrote, it covers his early, post WWII years as a son of Polish immigrants living in Cleveland. Illustrated by Dean Haspiel, The Quitter is, typically, brutally honest. To an extent not previously explored, Pekar was a fighter and bully in his youth, resorting to violence as a means of earning respect he wasn't otherwise getting from his peers, with whom he didn't fit in. He also had a habit of quitting when situations got hard, feeling he had to either master a situation or remove himself from it. These two faults resulted in years of troubled frustration, continuing into adulthood. I won't reveal the emotional denouement. We all know, though, that writing jazz criticism and American Splendor became ways for Pekar to successfully express himself. The Quitter is a fitting bookend to Pekar's writing career. Mazuchelli and Darwyn Cooke. It's a pleasing style with supple brushwork and expressive body language. The book Quitter by Harvey Pekar in my opinion was an interesting read. It's goes through his life as a boy whose parents are Jewish immigrants. It was a battle for him through the early stages getting in fights with kids at school and his parents. I would recommend this if you like to read autobiographical books. Blargh. God this was a boring autobio. I thought I loved Harvey Pekar and his messed up ways but the more he goes on about how miserable and boring his life is... well the more boring it is. No insights, no light and shade, no nuffin. He's depressed, and depressing. Harvey Pekar's autobiography left me wanting more from it. It just kind of runs down events in his life, but leaves out anything charming or interesting. Essentially, it's a series of fist fights and job losses. Just awful. Redundant and uninspired. Caption: "...after several months, it happened. I was laid off." Thought bubble: "Oh, no, I've been laid off." This is an autobiographical graphic novel about the comic book writer, Harvey Pekar. He details his life as a young boy growing up in Cleaveland, with his Jewish-Polish family. Throughout the book he talks about his various jobs. His insecurities. His young violent period as a street fighter. His bouts with sports in high school. He covers his early adulthood trying out the navy and going to college. He also details his relationship with his parents and other family. The artwork is not amazing, This is an autobiographical graphic novel about the comic book writer, Harvey Pekar. He details his life as a young boy growing up in Cleaveland, with his Jewish-Polish family. Throughout the book he talks about his various jobs. His insecurities. His young violent period as a street fighter. His bouts with sports in high school. He covers his early adulthood trying out the navy and going to college. He also details his relationship with his parents and other family. The artwork is not amazing, but does good job illustrating Harvey's story. It's in black and white, and the art style, though not to my taste, is okay. Although it was very good, I prefer the shorter, tighter, laser-focused American Splendor stories. 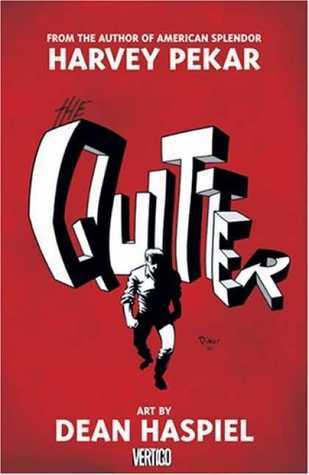 The Quitter is a great overview of Pekar's life, the anxieties that he (and we) faced, and a look at some of the cultural, economic and social circumstances that created the Harvey Pekar that we know via his comics. But the classic Splendor stories, despite their brevity, hit with more depth than The Quitter was able to muster. Still, it was pretty enjoyable. Harvey's conversational captions make th Although it was very good, I prefer the shorter, tighter, laser-focused American Splendor stories. 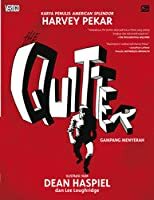 The Quitter is a great overview of Pekar's life, the anxieties that he (and we) faced, and a look at some of the cultural, economic and social circumstances that created the Harvey Pekar that we know via his comics. But the classic Splendor stories, despite their brevity, hit with more depth than The Quitter was able to muster. In this graphic auto-biography a man recounts his early life and initial efforts at writing. I found this book quite bleak, the basic point seems to be life is short so get on with what you want to do but don’t mess around at work. But I must admit that I’d never heard of this author or his ‘American Splendor’ series - so I am probably not the target audience for this book. A memoir of our favourite anti-hero in the ongoing battle of life, Harvey Pekar. Well written and the illustrations are fantastic. This book takes you through the challenges of a quitter. The main character struggles to find a job that suits him and struggles to fit in. Wahai pecinta buku, sering-seringlah ke Gramedia Grand Indonesia. Soalnya di sana ada tumpukan khusus untuk buku-buku yang didiskon. Harga buku ini cuma 15 ribu rupiah saja. Sekian sekilas info. Kenapa gw tertarik banget sama covernya? Soalnya sampul depannya ini kesannya macho banget! Judulnya The Quitter (yang dibuku ini diartikan sebagai 'Gampang Menyerah'). Tapi gambar di covernya justru kayak jagoan yang garang gitu. Pas gw baca buku ini, 'kemachoan'nya itu tergambar jelas dari gambar-gambar yang diilustrasikan oleh Dean Haspiel. Gambarnya tegas dan cowok bangetlah pokoknya. Bagaimana dengan isi cerita? Sebenarnya buku ini adalah biografinya sang penulis. Walaupun bukan biografi kehidupannya secara utuh. Dan membaca kisahnya ternyata memang nyambung dengan judulnya, The Quitter. Ceritanya sebenarnya berat, sih. Dan kadang terkesan terlalu berliku. Karena ada beberapa hal yang nggak penting juga ikut diceritakan. Tapi gw mencoba berpikir positifnya bahwa mungkin hal-hal nggak penting itu, berarti buat sang penulis. Dan mungkin hal-hal nggak penting itu memang sengaja dicantumkan untuk menunjukkan ke pembaca tentang segitu berlikunyalah hidup sang penulis. I've never read a book quite like this one. It's a graphic novel that tells the life story of Harvey Pekar, author and narrator of "The Quitter." He is an average guy who constantly feels like a failure, no matter what he attempts. As a Jewish kid growing up in troubled and sometimes violent neighborhoods, he gets into physical fights as a way to defend and improve his self-image. He develops another habit at an early age: quitting anything in which he does not immediately succeed. This applied to sports, classes in high school, making friends, and keeping a job. Throughout the story, Pekar admits that he is so afraid of failure, that he would avoid a confrontation rather than face it. This story highlights Pekar's struggles from childhood to retirement age. By the end of the story, Pekar has learned a lot about himself as a person. He finds that he does have the strength,courage, and ability to succeed in certain areas. Nonetheless, the story ends on an uncertain note. Harvey Pekar is the main character. He is brutally honest about his shortcomings, and he is very aware of how impatient and easily frustrated he gets. I found myself relating to him in many ways; I, too, am afraid of failure, tend to be impatient, and sometimes "screw up a good thing," as Pekar says throughout his story. I think young adults would find Pekar very interesting and someone to whom they could relate. Although the story is mostly told in chronological order, the older version of Pekar interjects throughout and comments on what the younger Pekar is doing. Harvey Pekar in this book is a hard character to empathise with, he is simultaneously a loser and a bully. He doesn't really explain the origins of why he acts like he does, just that he does. He isn't an unlucky man or a neglected child, it just seems to be his own foolish decision making and immaturity that leads him to failure. Of course, that in itself is his problem, and I'm sure he deserves sympathy, I just found it hard to give it. The book is a frustrating read, he brushes over the detai Harvey Pekar in this book is a hard character to empathise with, he is simultaneously a loser and a bully. He doesn't really explain the origins of why he acts like he does, just that he does. He isn't an unlucky man or a neglected child, it just seems to be his own foolish decision making and immaturity that leads him to failure. Of course, that in itself is his problem, and I'm sure he deserves sympathy, I just found it hard to give it. The book is a frustrating read, he brushes over the details that seem more interesting and dwells on the mundane minutiae of each job he's had. For example, his childhood is told in painstaking detail, then it rushes through his adulthood with little explanation. Perhaps his adult life is covered in his American Splendor series, but I haven't read that, so felt a bit lost. The theme of the book is his "quitter" mentality, and despite him discussing this psychology, I was still left wanting. I didn't leave the book with any clarity of what was going on in his head, or what exactly he was trying to tell the reader. Perhaps the confused message is supposed to reflect the confused nature of his personality, but whatever the point was, it simply didn't work for me. I wouldn't say this book was bad, I am indifferent to it. I come away with nothing, it has had not effect on me. Just looking at the blurb on the back, it describes it as his "funniest and most heartwrenching work yet, an unforgettable graphic novel". I couldn't disagree more. The Quitter inspired in me no emotion, I am at loss at how it could be described as funny, but most of all, I would say it is entirely forgettable. “My parents' work ethic amazed me. How could they put in such long hours, day after day?